Andrew “Andy” Lenssen has over 25-years of experience leading collaborative, interdisciplinary team projects investigating diversified, intensified cropping systems and their influences on corn, soybean, wheat, pea, lentil, chickpea, cool- and warm-season oilseeds, and annual and perennial forages, determining crop productivity and quality, water and nitrogen use and balances, and weeds, insects, and diseases, and potential environmental and economic benefits. Since coming to Iowa State University, his program has addressed corn-soybean system issues relevant to crop productivity and economic and environmental sustainability in Iowa, including incorporation of annual and perennial cover crops and rotation diversification with cool-season oilseeds and annual and perennial forages. Additionally, he has active research programs in Uganda and Mozambique in Sub Saharan Africa. In 2014 Andy and Dr. Ken Moore merged their field research programs. 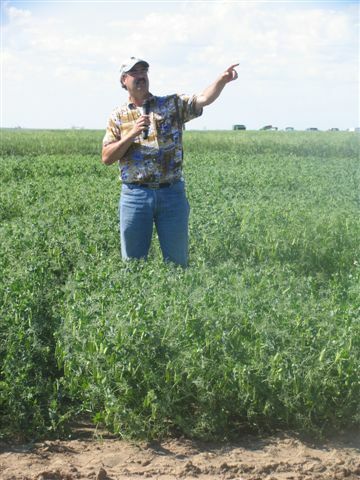 Prior to joining Iowa State University, Andy was employed with USDA, Agricultural Research Service, at Sidney, Montana as lead scientist for dryland research from 2003 to 2011. Prior to locating to Sidney, he was with the Department of Entomology at Montana State University from 1994 to 2003. An important part of Andy’s program has been to extend to growers, Extension, and agricultural industry personnel science-based research results and increase adoption rates of improved management and crop production practices. Andy has three degrees in agronomy, a BS from Cornell University and MS and PhD from Kansas State University. Prior to entering graduate school, he managed an irrigated farm and ranch with cow-calf and stocker operations in New Mexico. Andy started with ISU in October 2012. His appointment with ISU includes research, teaching, Extension, and undergraduate advising. Copyright © 1995-2012, Iowa State University of Science and Technology. All rights reserved.